In the State of Victoria, Australia, we live around Port Phillip, named after Governor Phillip who founded the Port Jackson New South Wales Colony in 1788. The most important natural landmark of Port Phillip is Arthurs Seat, named by Lieutenant Murray in February 1802 after the mount of that name outside Edinburgh in Scotland. It was climbed in April 1802 by Lieutenant Matthew Flinders of the Investigator. There was a short-lived settlement under Collins at Sorrento (on the southern part of Port Phillip Bay) in 1803. In 1835 there was an attempted development on the Yarra River, initiated separately by both Batman and Faulkner. It is controversial to consider Batman or Fawkner as the true founders of Melbourne. The first white resident of the area now known as Dromana was Edward William Hobson who ran cattle at the base of Arthurs Seat in the area which became known, from the Aborigines, as Kangerong. He became a close friend of a group of Bunurong Aboriginal people, and learnt their language. One of his Aboriginal friends even went by the name of Tommy Hobson. Edward Hobson had come to this area from Plenty in 1837, and he moved on to Gippsland in 1844. He was a second cousin of Captain William Hobson who features strongly in the history of Port Phillip and New Zealand. Edward was made to leave because of land grants to Jamieson and the McCraes, who settled permanently in the area from about that time. His brother Dr Edmund Hobson, visited him at ‘Hobson’s Flat,’ as it was called, (near where the Dromana drive-in theatre is today). Edmund owned a ship which later ran aground at ‘Banksia Point.’ His ship was called the ‘Rosebud,’ and this became the name of that suburb. George Bass had discovered Western Port Bay in 1797. In later times, any party travelling from Western Port Bay toward Arthurs Seat would have recorded their journey in terms of the ‘ridges,’ a term which we find in the community of Main Ridge today, and which has implications in the name of the town of Dromana. John Batman had arranged his so-called treaty with Aboriginal people along the Merri Creek in 1835. In 1836, Governor Richard Bourke sent Captain William Lonsdale to Port Phillip aboard the Rattlesnake, captained by William Hobson. Lonsdale was to be the chief legal agent, and to disavow the ‘illegal’ settlement by Batman. Under Fawkner or Batman, the settlement might have been called ‘Bearbrass,’ a possible corruption of an Aboriginal word, or ‘Batmania’ after John Batman. Sir Richard Bourke arranged for the new settlement to be official, and to be named ‘Melbourne’ after the Prime Minister of England, William Lamb, Baron of Melbourne. The Melbourne property in England had come into Lamb’s family as an estate, through his mother. This was a time of naming. Bourke named our Williamstown after King William IV (the sailor king), and also Hobson’s Bay after Captain William Hobson who had spent three months in detailed exploration and mapping of Port Phillip. Governor Sir Richard Bourke was Anglo-Irish, a cousin of the famous politician Edmund Burke. He was a protestant, Church of Ireland, and a strong opponent of the inequities imposed on the Irish Catholics under the Penal laws. He was older, but he shared many views with the Lieutenant-Governor of Waterford, Henry Villiers-Stuart. Captain William Hobson, a second cousin of the first settler of our Mornington Peninsula area, also came from Waterford, and his brothers were educated at Trinity College in Dublin. Later, in a letter to his son, Bourke boasted that he had replaced many ‘bush names’ with ‘good Whig names.’ He is known to have left a list of suggested names with Lonsdale, but this has not survived. 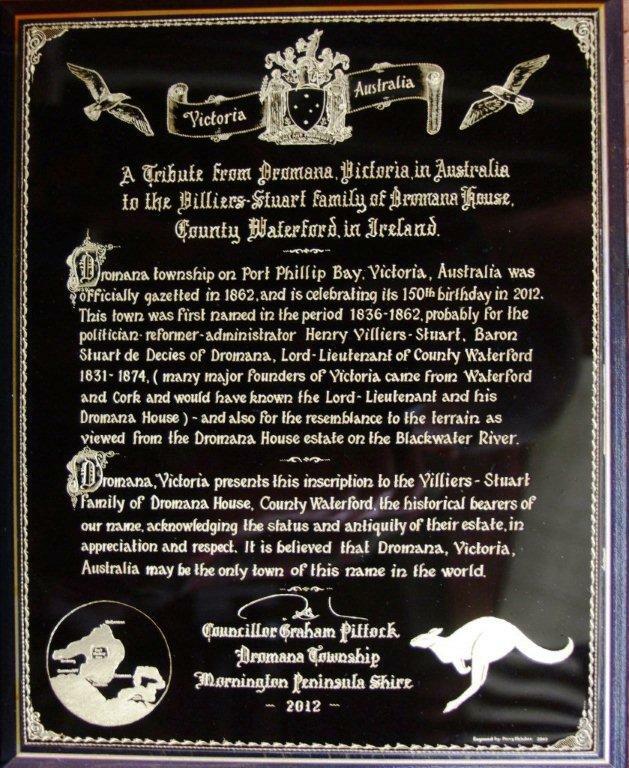 The naming of Dromana was done at a particular time, early in our history. According to the historian McLear, Dromana was a part of the Port Phillip coast which had been suggested as a possible place for a port, as had Corio Bay. In hindsight, knowing how the squalls come across the Bay, we can see that this might have not have been such a sound idea, but, under Arthurs Seat, this appeared to be a major location. Later much fruit, fish and timber were shipped from here. The name was chosen when the Baron of Dromana was an important figure in Anglo-Ireland, and when his Dromana Estate was a very large and respected demesne. The later decline of the British Empire and the introduction of the Irish Republic could not, of course, be foreseen. But this was an auspicious time in our history, and in Irish, particularly Waterford history, and sectarian history too. Dromana in Australia has grown in population and heritage of course, and now is served by freeways instead of its once very long pier. At the end of 1861, the township of Dromana was officially gazetted by the Victorian Government. Clearly its name was in use before that acknowledgement. In 2011-12, various local societies and schools celebrated the 150th birthday. This led to various speculations about origin of the name and any affiliations. Many of the residents of Dromana on the Mornington Peninsula, Victoria, believed that their town was named after a town in Ireland. Strictly speaking this is untrue though understandable. It could even be that the town’s name is confused with the Aboriginal ‘Drumdrumallock,’ which may have, to some people, a similar sound. Some people believed that this Dromana is named after one or the other of two towns named ‘Dromore’ in Northern Ireland – County Down or County Tyrone. This is also incorrect, though interesting. ‘Dromore’ comes from ‘drom – more’ meaning ‘ridge – high’ or high ridge. At least two local people went looking for the town in Ireland. One found his way to Dromana Gate, Waterford, but could not pass it in his rented caravan. Later, Councillor David Gregan and his wife Helen, drove to Dromana House, and photographed both the ‘Gate’ and the ‘manor house,’ but were unable to raise anybody when they knocked on the door. So at least there was the correction: the town in Victoria is named after a farmland estate, and not a town. This proved similar to my own first journey there, lost along winding lanes, mixing up town names, and failing to meet any owners. Indeed, like the Gregans, we assumed we were not really welcome on private land. Later we were to learn this is not the case. Mornington (Vic) plaque presented at Dromana Gate. L to R: Jennifer Code, Trevor Code, Barbara Villiers-Stuart Grubb, Emily Villiers- Stuart (mother), journalist (unnamed). Photo by Bill Flynn. Closer view of plaque, designed and created by Perry Fletcher, and photographed by Trevor Code. We discovered that Dromana is an Irish word, and that it existed before the Norman invasion, as an Irish ‘townland.’ According to the Irish dictionary ‘dromanna’ means the ridges, ‘-anna’ being the suffix which makes the word plural. The word is geographically appropriate. Although Dromana Estate is on a tidal river, the Blackwater, we could see how the nearby hills and ridges have some resemblance to our own terrain, at and beyond Arthurs Seat. The Normans built a castle on a high rock overlooking the Blackwater River. At a later time this castle was further developed, and then replaced by a mansion, later reduced to the manor house which is still there today, and occupied by the same family which has ruled, farmed and lived in this place for eight hundred years. There are old documents showing that the family had fishing rights along the Blackwater River below the castle, at the time of King John, in 1215. Historically the family were Fitzgeralds, but through female heiresses, the name has been changed three times, and in the late eighteenth century became Villiers-Stuart. 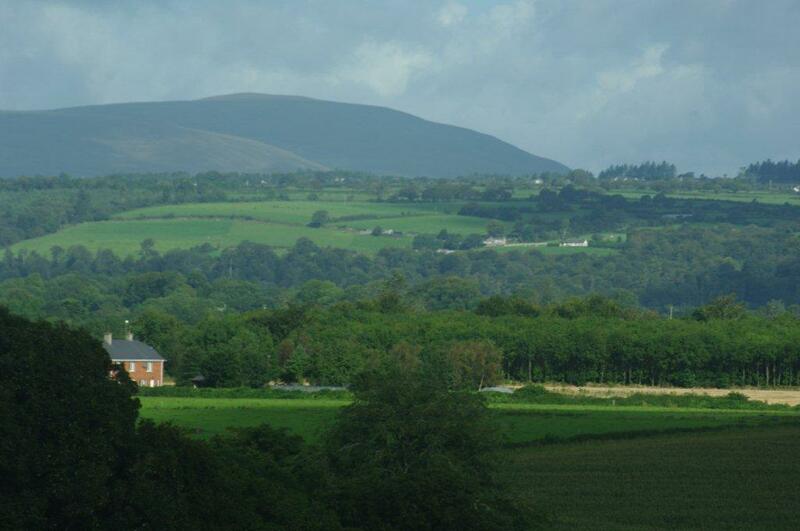 The estate was never a town, but at one time in its history, the Villiers-Stuart family created a town within their estate, and that town is called Villierstown. The town still exists, and is of course independent today. The history of the owners and rulers of Dromana is fascinating, and tracks much of the history of Ireland through its turbulent past. In old documents, Dromana has certain variations in spelling, such as ‘Dromanny’ and even ‘Dromannough. The estate was once greater than 60,000 acres, but now is only 30 acres. The great mansion and the stables are gone, but Dromana House is still a place of aristocratic grandeur, and is full of historic interest. Tourists visit it almost daily throughout the summer. What do we know about Henry Villiers-Stuart? He was actually born in England and educated at Eton. His name was Henry Crichton-Stuart. His mother was Katharine Villiers, Viscountess Grandison of Dromana House. As the heir of Grandison, Henry changed his name, by Royal consent, to drop Crichton and insert Villiers. Hence he became Henry Villiers-Stuart, the name the family has borne ever since. He was acknowledging his mother and the female line, but he was also placing himself correctly as the heir and future owner of Dromana Estate, which became his home. 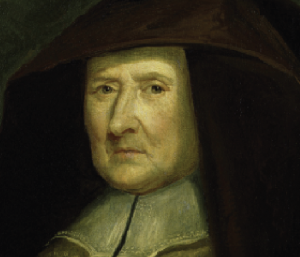 He was a protestant member of the Church of Ireland, but, like his father and also like Sir Richard Bourke, he had great compassion for the Irish Catholics, who suffered so severely under the Penal Laws, originally introduced to disempower the Catholics following the Reformation, the suppression of Catholics by Cromwell, and especially the failure of the deposed King James at the Battle of the Boyne. The terrible repression of the Irish people was brought about by English fear of the Irish Catholics and their European allies. English military thinkers assumed that Ireland is a good jumping off point for an invasion of Britain and Wales. Like all repressive legislation, if we think of colonialism in general, and even the contemporary ‘war on terror,’ the people most afflicted were the ordinary and mainly innocent peasants, many of whom would have been goaded into rebellion in the long run. Following the political ideals of his father, Henry Villiers-Stuart began to fight for Catholic Emancipation, allied himself with Daniel O’Connell, won a seat in the English parliament where his speeches were very strong, and his voting record made him many enemies amongst the ruling class. He also worked to enrol his own tenants, 600 of them, with the right to vote. He lost his seat in the general election. The contrast was a neighbouring landlord who expelled tenants who had voted against him. The Penal laws forbade marriage between Protestants and Catholics. Henry married a Catholic, Theresia Pauline Ott, apparently at least twice, in 1827 and 1828. This was controversial at the time. He had already committed himself to alleviating some of the burden on Catholics before this time, and the marriage seems to be at about the same time as the Catholic Emancipation Act. The significance was not lost on his Catholic tenants. He had supported them politically and he had risked much by marrying a Catholic. (There were to be tragic implications to this marriage, which I will address later.) When Henry brought his bride to Dromana House, the tenants, to whom he had already proved a good landlord, erected a triumphal arch at the bridge over the River Finnisk, the very point where they would turn to Dromana House. We are told that the bride was utterly delighted at this structure, as so was Henry. He engaged the famous architect, Martin Day of Wexford, mainly known for his Church of Ireland buildings, to build a suitable memorial structure on the site. We do not have any pictures of the original tenant-built arch. Martin Day’s ‘Dromana Gate,’ mainly of stone, recalls the British Royal pavilion style (as at Brighton), and has been called ‘hindu-gothic’ because it utilised elements of ecclesiastical architecture, but added a superstructure reminiscent of the Indian Raj in its cupola and ornamentation. This very original building is considered unique in Ireland, and is a world-famous tourist attraction, which has been renovated and maintained, and is now in the care of Waterford County. Dromana Gate. Photograph by Bill Flynn. 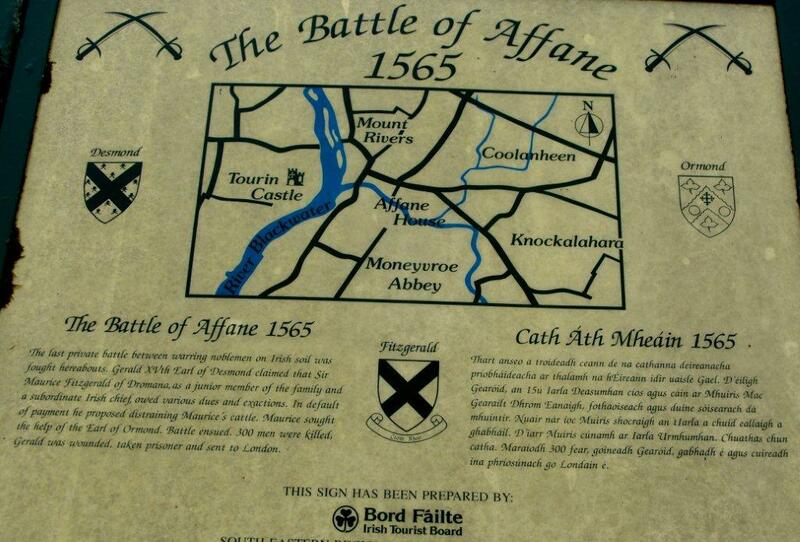 It was at the site related to the Battle of Affane, the last war fought by private armies, to the great offence of Queen Elizabeth I. So it is a peace bridge at the location of an earlier famous bloodletting. It commemorated the marriage of a Protestant to a Catholic, and it did this in defiance of repressive laws. 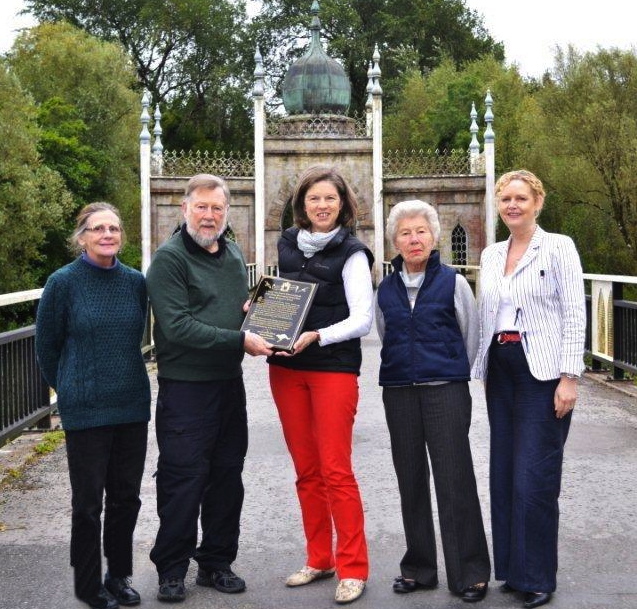 It commemorated the imaginative and grateful act of the tenants towards the owner of the Dromana Estate. It participates in the very passing of the Catholic Emancipation Act, which was a beginning, if only a beginning, in the alleviation of peasant and Catholic suffering. It has grace, serenity and class, partly because of the way the Indian motif is evoked; it is a monument to reconciliation and peace. The design itself is remarkable. The two equal buildings, each resembling a church or chapel, are held together by a symbolic bridge or arch, and in a manner which suggests harmony and grandeur. Perhaps we may think of one side as Protestant, and the other Catholic, with the super-arching peace bridge between them. In our post-colonial age, it continues to catch the imagination and has stood the test of time. One would hope it will be an everlasting memorial to good government and the bridge between peoples. When I first started this investigation, I thought the essential connection between the countries would have been the landscape, that the terrain as seen along the Blackwater River had some resemblance to the Arthurs Seat and Mt Martha rises, and the valley between. And that may be so. If so, it is timeless, except that our Dromana is so built up today, while the views along the Blackwater remain much as they were. In our own time, we can go there, see the Dromana Gate edifice, visit the old Dromana House, perhaps accept some of their kind hospitality, and take photographs which reflect this interpretation. I have done that. But as if it is some kind of detective story, I think the plot lies elsewhere. We think of the whole county of Waterford, and of Dungarvan, Ardmore, and Youghal, and a more complete understanding of Dromana Gate. The key figure, as I have said, is Henry Villiers-Stuart, – Baron Stuart de Decies of Dromana, and against all expectations, both the inspiration and the contracting owner of Dromana Gate. Henry’s is a complex story, and Dromana Gate has complex meanings. The owners have now sold this attraction to County Waterford, for the princely sum of €1.00, and the County has charge and responsibility for its maintenance. Had they really known its implications, should they have sold it? Or did they have no real choice in the matter? And if the County really appreciated its history and its meanings, would they not respect it more? I have heard that it is resented by truck-drivers, who like to shortcut through this way. This is a unique structure, a magnet for tourists, but surely it is much more than that. I suggest it is a symbol of which Ireland should justly be proud. To trace this is a little like reading a mystery thriller. The interpretations are available, with just a little thought. 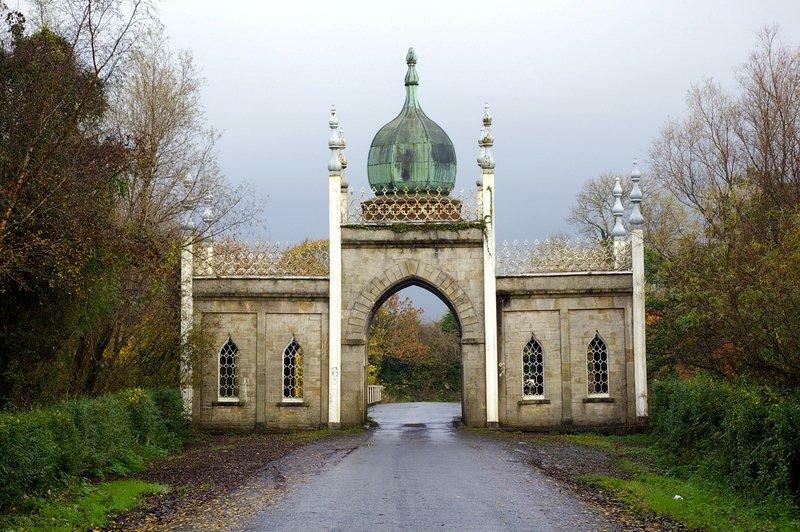 Dromana Gate is not a monument in the manner of a burial site. Ireland has so many of these. Nor is it like a Holy Well, many of which are forgotten or polluted. Indeed, it is much more a living celebration, and it is forward looking. It is a symbol for Ireland, with implications for Britain too. It leads us back inevitably to its author, Henry Villiers-Stuart, the actual first and last Baron (Stuart de Decies) of Dromana. His life is the story, and it is for him that the Australian Dromana is named. Henry, from the portrait we have of him in uniform, was good-looking, lithe, willowy, reputed to be an idealist and a little impulsive, but a man whose decisions and character one can admire. He also has a sad story. He recovered his family’s prestige. He became a baron. But his son, in spite of prolonged hearings before the House of Lords, was denied that title. There is a story of religious prejudice, but also of betrayal and blackmail. Theresia gave the impression that she was a widow and that her two previous sons came from her deceased husband. Later it emerged that this partner was still alive, but that they had never been formally married. The original ‘partner’ blackmailed Henry, and it is said that Henry stopped speaking to his wife. It meant that, for Henry to provide continuing inheritance of his title for his son, he would have to declare those stepsons to be ‘bastards’. This neither he nor his legitimate son was willing to do. Times were different then. Does it matter? As I have noted, in 1831, the British government of Lord Melbourne appointed Henry Villiers-Stuart Lieutenant-Governor of Waterford County. The appointment of the Lieutenant-Governor was a transitional and controversial move of introducing this English governorship to this part of Ireland, but it restored authority to this family in such a role after many years in abeyance. Henry Villiers-Stuart retained this role until his death in 1874. His role would have continued through the appalling times of the Great Hunger through potato blight, and although there was some relief from England in its first year, the fact that England had ample food supplies available in Ireland, but did not sufficiently relieve its citizens in Ireland, must be an appalling stain. Because of the English system of taxes, many landlords found it convenient to move their tenants off the land, and even to promote emigration to Canada or America. It is said that Dromana House looked after its own tenants, but the County of Waterford did suffer badly. Waterford was a powerful English-based county in Ireland at the time, and with Cork, its Anglo-Irish culture was to have a significant role in the development of early colonial Australia. Many colonial officials and dignitaries, including law officers, came from this area. Amongst others, as noted, Waterford was the home of Captain William Hobson, whose brothers were both educated at Trinity College, one of them being the archdeacon of the Church of Ireland in Waterford. We know that the first Irish-born governor of the Australian colony of New South Wales, Sir Richard Bourke, had visited Lismore, and therefore was most likely to have come to Dromana and Waterford, and that he was a close associate and proponent of Captain William Hobson. Hobson in turn would have been associated with Henry Villiers-Stuart, and would almost certainly have been entertained at Dromana House on the Blackwater River, where Villiers-Stuart constantly and lavishly entertained his associates. The Blackwater River is navigable at least as far as Cappoquin, so guests and the Governor would probably have travelled by water to the residence. Henry became officially Baron Stuart de Decies of Dromana in 1839, but for our purposes, it is convenient to think of him as the Baron of Dromana. 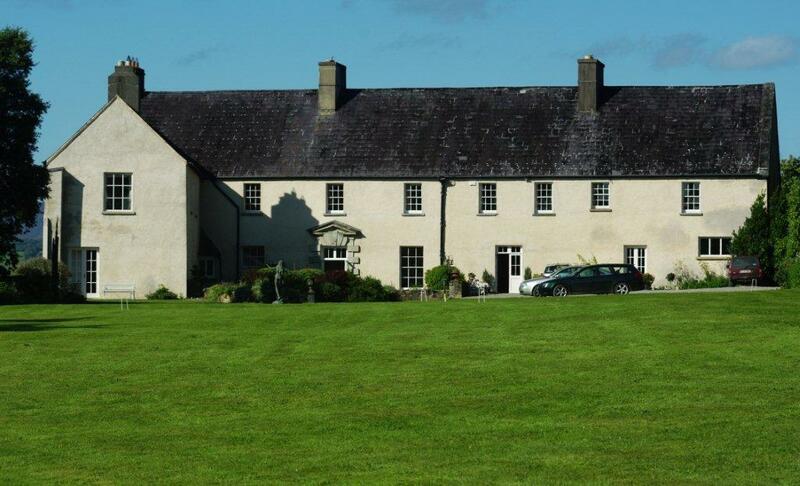 Dromana House is near Cappoquin, Co Waterford. In 2013, we stayed as self-catering guests there from August 31 to September 7. This of course means we arrived fairly late on Saturday August 31, and left about midday on the seventh. We have been steeped in the history of Ireland, partly through the study of crumbling castles and damaged town walls. Dromana House is different. We enter a world of living history where the great house speaks of centuries’ old history, which is still recalled in paintings of ancestors, memorabilia such as a little ciborium from Theresia, and even weapons of a bygone era, but where the owners are modern, very civilised, amenable and gracious, and where even their three Labrador dogs are affectionate. The ochre-coloured walls of the great building are impressive. One can easily forget that there was once a grand mansion attached to the front, with a great ballroom, and that this, along with the historic stables, has now been demolished. Something of grandeur has no doubt been lost: it went with a world of hunting and idle life which has long passed; but it does not seem diminished when one stands here, or wanders through the gardens and available rooms. We are brought to live in the past and the present at the one time. Below the house is the tidal Blackwater River, so shallow at the ebb that the flat brown banks appear above the surface, and yet so resplendent that trading schooners once sailed here, and tourist boats, especially that of Tony Gallagher, can still go up to Cappoquin – when the tide is right. Across the river one views the many-coloured fields with their black and white Friesian cattle, and farther off the gentle yet daunting, almost living, hills or mountains. We were there at the opening of the duck season, and we could hear distant gun fire. We also saw a boatload of shooters, reminding us of the old Viking etchings, four to the boat, as they churned up the river in the evening light, possibly against the flow. The whole setting is most beautiful: the garden and adjoining woods, no longer grand and expansive, but still a joy in which to walk. It is a most peaceful, restful place, which has hardly changed in atmosphere since Carlyle stayed here briefly in the nineteenth century. Dromana House is friendly and welcoming, not with the commercial panache of a hotel, but simply as a welcoming and receptive grand home. Barbara, Nicholas and Emily make you feel you belong here, and have just come into the kitchen for a cup of tea, even when they are making preserves, or when they are preparing for a much larger touring party to come on a bus tour. Yet the home is magnificently historic. Around 1200 AD, the occupants, of whom these are the direct descendants, had salmon fishing rights on the Blackwater River, and these rights continue to this day. The guest too may fish if he or she wishes. There does not seem to be any false note in this aristocratic household offering self-catering – two excellent and spacious self-catering apartments. In the east wing there are the many rooms which were once occupied by the butler and the governess. Overlooking the river is a converted set of rooms, with spacious living room, kitchen and lounge room upstairs, and two lovely bedrooms opening onto the patio downstairs. The accommodation is well furnished and equipped, and more spacious, I would think, than many average houses. I love the old photographs on the walls, particularly of horsewomen in another age. You relax, read or write here, in the apartment, or in the garden, or have conversations with members of the family, who share what they are doing, in the garden or grounds, and in planning various events. In the summer, we are told, whole busloads, many from England or the continent, come here to visit, and are given a tour of the house and some of its treasures. At the edge of the off-season, Nicholas is busy opening up walking paths, bringing in firewood to the stacks, and establishing, with the aid of some paid help, a duck pond. I look forward to seeing the ducks when I next return. Here, I think, one catches up with one’s own dreams and sense of history. If you are like me you do not want to leave. So Dromana House is coming up to the celebration of a proven 800 years occupancy and development of this site. 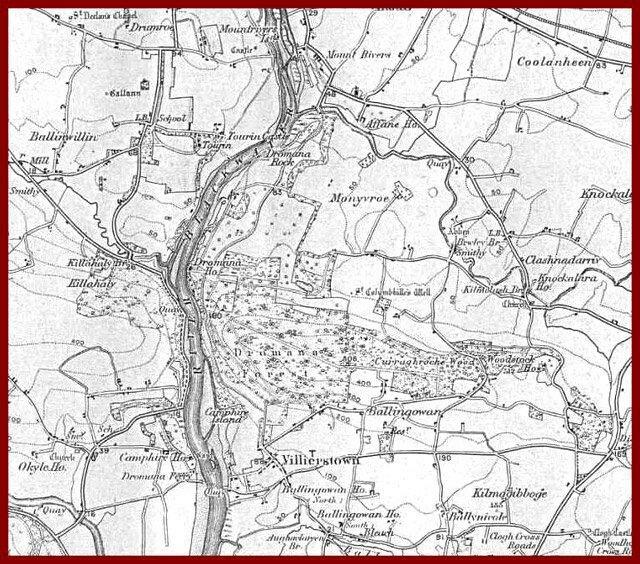 That much is documented, but the antecedent members of the family may have been here, even before that, first with a castle, and later with a mansion, and for many years with sixty thousand acres within which they founded a village, Villierstown, but now reduced to this comfortable garden and workspace. I like to walk out, across the croquet lawn, and down to the bastion where I can look further down the river. I do not think there are ghosts here, but certainly there is a grand spirit. Inevitably conflict must have occurred at times in past centuries, but one gets the impression that with all the hard work of the day, this estate is nevertheless blanketed in peace and serenity. For me, it is something I take with me when I leave. How is the family to commemorate and celebrate these 800 years? There are plans, I have heard, to create a genealogical table, and that is remarkable enough, and Herculean enough, in its own sense. They were here hundreds of years before the Reformation in Europe and England, and therefore long before Henry VIII or Oliver Cromwell, before the Europeans went to America, and certainly centuries before the British ventured to Australia. It may seem a trite question to ask, but if the Americans are American, the Canadians Canadian, the Australians Australian, then what is the true designation of the historic Irish in Ireland? You can’t talk of them as Norman invaders. Indeed, as much by them as any other group, we may define Irish by encountering these inhabitants. For the commemoration, I have suggested there should be a great historic traditional or fancy dress festival, where all come to represent the ages and occupations which have gone before, possibly (preferably) with music as well. I like to think there might be a writing and drawing competition for local and regional schoolchildren. Perhaps special attention should be given to telling, and even re-enacting, the story of Catherine, the Old Countess of Desmond, who was born and died at Dromana, who when young supposedly visited England at the time of Edward IV and danced with Richard of Gloucester, later Richard III whose body has recently been discovered in Leicester in England. Catherine survived the Plantagenets and Tudors, and eventually ‘walked’ to Hampton Court Palace to put her case to James the first Stuart King of England. She finally died under a cherry tree it is said, here in Dromana, at the age of 140. 1. I would think one notes the historic contribution and benevolence, including the founding of Villierstown, the assistance to tenants at the time of the potato famine, and even the family relationship with the independence movement. 2. As has already been suggested, there needs to be an illustrated genealogical table showing the lineage. It cannot show all the side branches, for this would be cluttered and a digression. 3. There needs to be a map and association with the ports and towns, the established historical and economic relationships. These towns need to be part of the event, and share in it, supporting the connection, through museums, schools and libraries. 5. No one knows the full or real story of the Old Countess Desmond. But her history needs to be re-told. It is well attested and documented. Perhaps the BBC or Irish television could revisit her story. What a great epic film or TV series her life might make! The recent discovery of the bones of Richard III could be used as a trigger for this, and the Richard III society might be interested. There is a movement to rehabilitate his reputation. Catherine was supposedly at the court of Edward IV, and danced with Richard of Gloucester before he became king: she said that he danced well, and that he was not a hunchback. There is the whole story of her relationship with Sir Walter Raleigh, who attested to her age. The story of her travelling to England to see King James could be re-enacted in various ways, even through a long-walk challenge, or a marathon – if the right group could sponsor it. I don’t know when cherries would be in season, but somehow her relationship to cherries would come into focus, not in terms of her death, but in terms of wonderful longevity. ‘The Cherry Tree Carol’ uses cherries to celebrate Mary and Joseph. Similarly a symbol of cherries and long life – and walking distances – could be used. 6. There is a difficulty in this time, which must be overcome. I refer to the revisionist history, and the otherwise praiseworthy Irish republic. There is a tendency to set aside English roots, and to retell Irish history in terms of supposedly Celtic origins. Even today, I have had people assert that those of supposedly Norman ancestry are not truly Irish. Every nation needs its mythology. But I think, with Dromana House, it should be possible to celebrate its aristocratic inheritance, and portraiture, especially to attract British and European guests in the 800th celebration, while having a bipartite acknowledgement of essential and real Irishness. I admire the genuine Irish here, as distinct from Blarney, ghost stories, leprechauns, and pookahs. This is partly to do with the economy and social development of course: agriculture and industry, but also cooking, and social as well as festive customs. Dromana House must use this occasion to say: we are truly and proudly Irish. 7. Should there be competitions? I am thinking of painting or drawing, and writing. Should these be aimed at school children or adults as well? I am wondering whether the children in Dromana Australia might want to contribute any art or other communication? 8. I ask about funding. Some of the activities might attract a tourist or arts grant. But I am aware that Dromana House itself would need to be careful that a celebratory display is not done at a cost which is not returned as investment. 9. It seems to me that such a festival should be a bringing together of the disparate elements of this whole extended society. Trevor Code has taught Literature and Writing in universities in both Australia and the United States. He has a lifetime association with Dromana Victoria and has lived there permanently since 2004. It is lovely to think of heifers in connection with the historical Dromana, for this is good grazing country even today, and the early Hobson settlement in Victoria was for running cattle too. But Deosamh should know that Dromore and Dromara are Northern Ireland and UK, where his derivations might apply. Language is so fruitful and multi-valenced. Of course, Dromana would be an anglicization, but from the oral tongue rather than a script, and not from a confusion of n and r. The very early documents do have variations of spelling, such as Dromana, Dromanna, Dromanny and Dromanough, but these go back centuries and not in the direction suggested. The dictionary seems a useful guide, and actually points us to a valuable neolithic relationship to the organic and skeletal, as in mythology, for the land is alive. The word can refer to landscape, but it can also refer to the spine and its bumps, as in a pig or a cow. The various documents, charters and maps all seem to confirm Dromana, not just as an estate for 800 years, but as a townland before that. The author has provided a map subsequent to publication, probably dating from c18, and featuring the name Dromana four times. As a former native of Co Antrim, I enjoyed Trevor’s research and writings about Dromana. We visited the bridge in 2004 driving a borrowed campervan, so perhaps we are the aforementioned Australians in Trevor’s article. We now live near Dromana, Australia and knew the Greggans before Cr Dave passed away. Hope the 800 year anniversary in Co Waterford is a success. « A mad and wonderful thing?